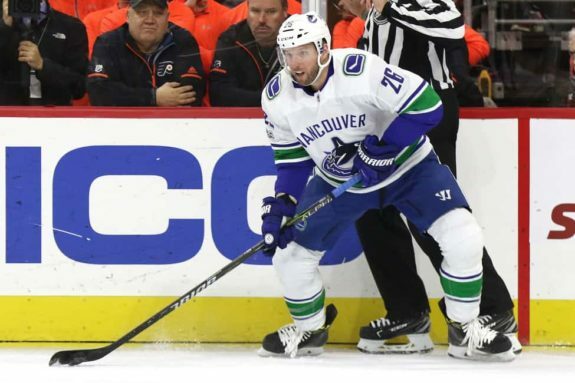 On to his eighth career team, the Vancouver Canucks announced that they have traded veteran forward and long-time NHLer Thomas Vanek to the Columbus Blue Jackets in exchange for forward prospect Tyler Motte and another veteran in Jussi Jokinen, according to TSN’s Bob McKenzie. VAN expected to receive Tyler Motte and Jussi Jokinen in exchange for Thomas Vanek going to CBJ. Vanek was a first-round pick of the Buffalo Sabres at fifth overall in 2003. Now, at 34 years old, he’s in his 13th NHL season and still producing at a level that makes him a useful tool for a team heading into the home stretch of the season and hopefully the playoffs. Right now, the Blue Jackets sit in the second wildcard spot in the Eastern Conference, just two points up on the New York Islanders with a game in hand. Because of that, the addition of Vanek is a major one for a team that can use all the offence they can get. In 61 games this season with the Canucks – his first season in Vancouver – Vanek has 17 goals and 41 points. 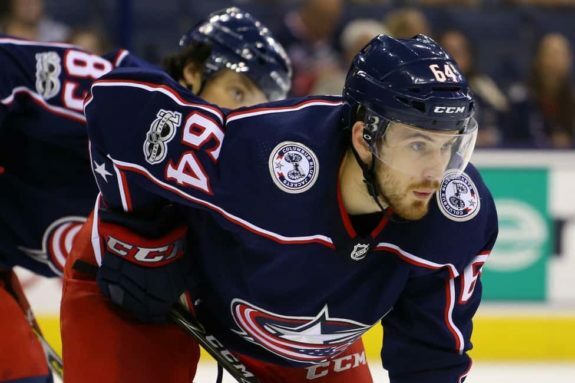 He was tied for second on the team in scoring before the trade and will join the Blue Jackets and step in as the second-highest scorer on their team as well behind just Artemi Panarin (who has 50 points). Over a career that has spanned 946 regular season games, Vanek has tallied 350 goals and 738 points – numbers that should certainly be welcomed in Columbus where the Jackets are averaging just 2.62 goals per game. Vanek is a pending unrestricted free agent (UFA) after signing a one-year deal with the Canucks on Sept. 1, 2017, that will expire following the 2017-18 season. As for the Canucks, they get Jokinen who is 34 years old and is finishing off a one-year contract that he signed with the Edmonton Oilers prior to the season. The Jackets claimed Jokinen off of waivers earlier in the year and toss him into this deal to move his contract, more than likely. His cap hit is $1.1 million and he will become an unrestricted free agent at season’s end as well. If the Canucks do dress Jokinen, they will have a guy in the lineup that can add a little bit offensively. That said, he is definitely on the decline as he has just seven points in 46 games this season. As for Motte, the Canucks get a 22-year-old who has produced in the AHL, but who has struggled in the limited NHL action he’s seen in his young career so far. Motte has just five points in 31 games this season and 12 over 64 career regular season games. That said, he had 11 points in 17 games with the Cleveland Monsters at the AHL level this season and has 32 points in 65 career regular season games in the AHL. Motte is in the second year of a three-year entry-level contract with an AAV of $925,000 and will be a restricted free agent following the 2018-19 season.